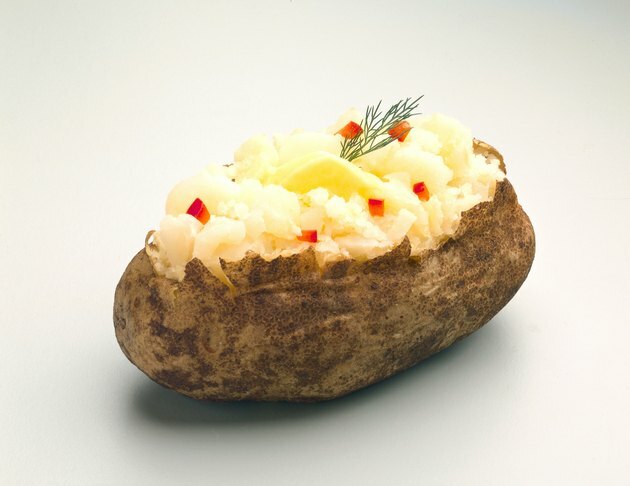 Baked potatoes are known to send your blood sugar into an uproar because of their high carbohydrate content. But not all potatoes have that effect. Some baked spuds are low on the glycemic index, causing minimal glucose elevations. Whether or not you eat your steamy side with the skin on makes a difference. Peeling your potato makes it digest quicker, causing a bigger effect on your blood sugar. The glycemic index, or GI, is a scoring system for foods containing carbohydrates. High-GI foods, with a score high than 70, cause your blood sugar to spike quickly. Medium-glycemic foods rank at 55 to 70 on the scale and have modest effects on blood sugar. Ideally, the majority of the foods you eat should be low on the glycemic index and have a rate of less than 55. These low-GI foods raise your blood sugar slightly over a longer period of time. Russet potatoes are some of the worst offenders when it comes to upping your blood sugar. A baked russet has an average GI rank of 85. If you eat the skin, it falls a bit lower, whereas peeling the skin away makes it as high as 111. Baked white potatoes tend to fall at around 50 on the glycemic scale, although you have to leave the skin on when you eat them. Otherwise your low-glycemic baked tater can be closer to 100, making it highly likely to make your blood sugar surge. Rather than your usual starchy spud, opt for a baked sweet potato. A cooked sweet potato can be as low as 44 on the scale. Although if you don't eat the skin, that low-GI sweet potato is more likely to elevate your blood sugar, because the score can go up to 78. Or you can opt for a yam instead. Yams have an average GI of just 37, with the skin on or off, meaning they'll have little effect on blood sugar. Most of the ingredients you may add to your baked potato aren't likely to spike your blood sugar. Meat and cheese do not have a glycemic rating -- meat doesn't contain carbs and cheese only has a trace amount. You can add on turkey bacon crumbles or reduced-fat shredded cheese without worrying about increasing your blood sugar. Any spices and herbs you sprinkle on won't impact your blood sugar either, because they are virtually carb free. Creamy dairy toppings, such as low-fat sour cream or plain yogurt, do have glycemic scores, although they're very low and shouldn't have drastic effects on blood sugar. How Does Ice Cream Affect Your Glucose Reading?